Sculptural and architectural hubris - put in it's place. Continuing with my interest in observing geometric forms and replicating them in stone, I decided to carve a sandcastle in sandstone. 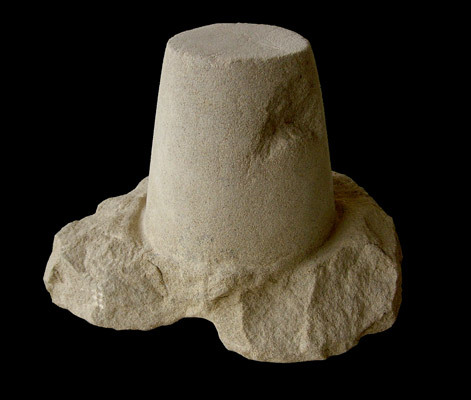 I was interested in exploring the similarity between the mundane recreational activity of making sandcastles and the high-art process of carving the same material in its stone form. 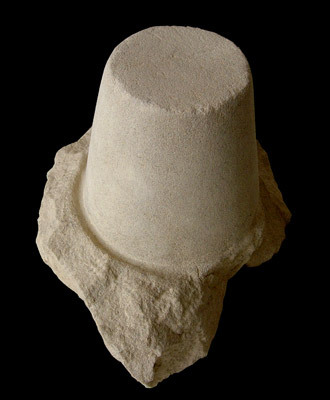 Making 'bucket' sandcastles is sculpture/architecture for everyman and child, I like the way the process of making is so easy and the finished result shows this making process in its form. Also the basic 'bucket' form is recognisable but not elaborate in anyway, it is reductive but also open to being used in a variety of ways through positioning, multiplication or addition of flags or shells. This carving is a 'ruin' in the sense that the piece of stone I used had flaws in it which affected the carving. I don't see the flaws as detrimental though, it adds another metaphorical layer, castles can become ruins and sandcastles themselves are never perfect, precise objects - they are liable to collapse if not made correctly.